A former science teacher who traded Bunsen burners for brie has carved out a new career paying homage to fromage after securing support from Launchpad; a Sheffield City Region wide programme aimed at helping the next generation of entrepreneurs. Nicola Kay launched mobile street food business The Cheese Cave in June 2017, after deciding to put her career as a secondary school Science teacher on hold. Keen to take her career in a different direction, the Retford-based entrepreneur hit on the idea of developing a mobile munching machine whilst chomping on cheese. With a business idea in mind, Nicola devoted her spare time to broadening her knowledge of the industry, touring the UK’s food markets to source and sample some of the UK’s best cheese, as well as successfully completing a diploma with the Guild of Fine Foods through their specialist Cheese Programme. With her research completed, Nicola set to work creating a menu which uses locally sourced organic products to produce great grub to countless cheese lovers across the country. As well as supporting local cheese producers, Nicola has also developed a range of unique recipes which combine traditional food staples with her knowledge of specialist cheeses. Examples include The Corny: a vintage cheddar and corned beef toastie; a ball of melted cheese aptly named Scotch Eggless and chips smothered in melted Stilton sauce to name a few. Whilst testing her recipes on unsuspecting family and friends, Nicola began scouring the internet in search of perfect portable premises. She soon discovered a vintage Rice horse box in Wales and after an extensive refurbishment, Lily the Cheese Cave horsebox was ready to race around the UK. But without any business knowledge or finance to get her started, Nicola found herself well and truly grounded. It was a chance meeting with a food inspector, who gave Nicola’s horse box the all clear to begin trading, where Nicola was made aware of the Launchpad programme and intrigued about the support it could offer her, she contacted her local Launchpad delivery partner, Bassetlaw Council. The fully funded ERDF programme has been developed to support entrepreneurs and individuals who are considering self-employment, providing them with access to a wide range of resources including training workshops and expert guidance through Business Advisors and Mentors. Working alongside a dedicated business advisor, Nicola was able to work towards understanding sales forecasting and how to promote her business on social media. Her business advisor also put her in touch with a grant scheme available through Bassetlaw Council, which could provide financial support to launch her business venture. After impressing a panel, Nicola was awarded a £1,500 grant to help get her hungry horsebox on the move, as well as securing two event opportunities. Today, Nicola and her horse box have become a regular feature at food festivals and fayres throughout the region, appearing at Doncaster Fake Fest, Retford Steam Punk Festival and the Bawtry Christmas light switch on during the first few months in business. Nicola has already secured slots almost every weekend throughout 2018 where she is touring Yorkshire attending events, weddings and even beer festivals, where Nicola’s unique savoury cheese weddings cakes can be sampled. 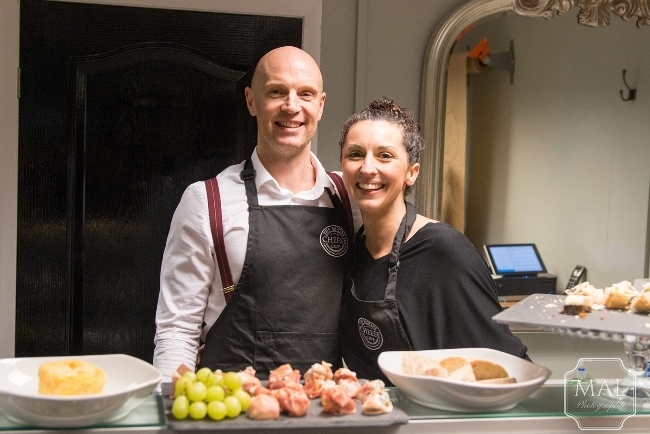 Nicola Kay, The Cheese Cave, said: “I’ve always been a big food lover and after working in the teaching profession for some time, I felt the time was right to take my career in a new direction. I wanted to put my passion for fine food to good use and launch my own business. “It’s been a really interesting and rewarding journey and when I began thinking about setting up my business I had no idea it was possible to gain a diploma in cheese. I knew that for my business to work, I had to know all there is to know about the British and international cheese market, how to select the best products to sell to my customers and to understand the cheese making process. “Travelling across the region and further afield to serve homemade, fresh food using one of the best ingredients readily and easily available is something I’m really enjoying. Cheese is often blamed for causing nightmares, but the success I’ve achieved to date has been beyond even my wildest dreams! Fiona Humpage, business advisor, Launchpad, said: “The Launchpad programme was launched in 2016 to provide entrepreneurs and start-up business owners within the Sheffield City Region with free-to-access support and advice to help them on their business journey.